I'm going to make a new video about that. The one I made before was really bad so I want to revamp it. ^To make a spoiler just place a [ spoiler ] at the beginning and a [ /spoiler ] at the end. The information displayed here is my personal way of tuning cars. These are what I call my base tunes. - Figuring out which direction to tune the car. - Placing a good tune on cars you are too lazy to tune. - Install Street Springs OR re-install Stock Springs. Send that my way, I'd like to give it a go. A on Sports seems like an oxymoron lol. Before turbo glitching this car, buy the fully upgraded intercooler. It will add some weight, but allows you to fit race brakes. Ill go through these tonight and update the OP. Hey im new to the forza touge scene and would just like to clear something up.when i see times likes 4.34 (new down hill) does that mean they ran that in practice from stand still?because the best ive gotten is 4.49 and i feel my car is perfect and ive probably driven the mountain 100 times. would just like to know what im doing wrong? ae86 - 4.50.04 . miata - 4.50.11 and datsun 510 - 4.49.76. Can Somebody plz help me! From a standstill in hot lap, or public lobbies, people can run times like 4:34 and below. If you think your car is perfect then that's great, however, saying you've run the mountain like 100 times isn't really saying much. It doesn't say that you're experienced it actually says quite the opposite. Experienced drivers have run Kaido at least a couple thousand times (I would say I've done about ~3000-5000 runs in my Forza career). True dedication and relentless persistence, coupled with excessive obsession about perfecting your driving, is the only way to achieve the best times. If you want to know what you are doing wrong then we can't say anything other than you haven't practiced enough. Don't worry though, there are dozens of people here who run 4:35 and below in many different cars who would gladly lend a helping hand. Well it Looks like its time for me to do some serious practicing if im ever gonna get that fast. 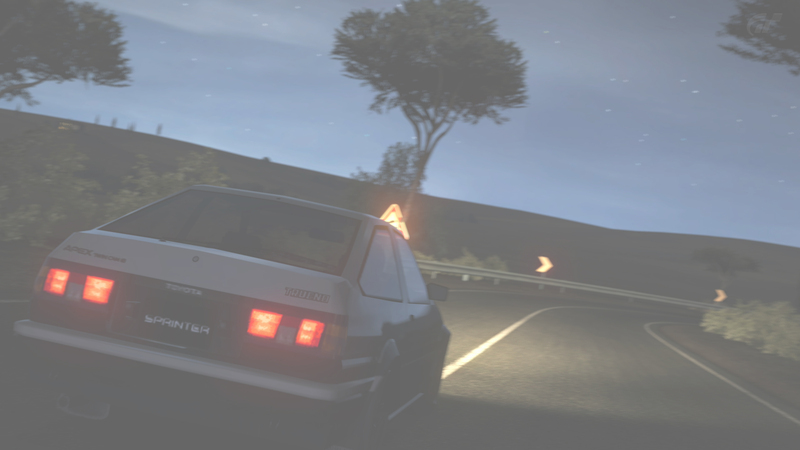 i would love to have some practice runs with anybody and just get in contact on the mic and just get touge friends really.i play for a bit everyday.i am based in new zealand so i dont know how times compare to you guys. my gamertag is AFR1CAN SL1D3R .Ive been drifting since FM3 and then moved onto multiclass circuit.But ive grown to love NA engines and playing the cat and mouse game with turbos.so i spotted this forum a few weeks ago and got excited.i havent met anybody on here tho but i would love to.ive cleared up my friends list and would love to fill it with fellow mountain lovers! Gamertag is AFR1CAN SL1D3R <-- all the i's are ones ( 1 ) .hope to chat and run with you all soon. Youll look back at your car, tune or things like corner speed and go "how did i not go faster there?" I find myself on any track that i come back to after a while scratching my head and wondering how i was able to take it as slow as i did in the past. Lots of practice will get you where you need to be . Running more passes will help but for me when i ran that same time i stopped running fujimi and ran on other tracks and when i came back i had found 10 seconds. Having not run a pass in over a month i think if i came back i might be a second faster than before. Hello 36s > here i come. Can someone help me with this tune? 1) Get rid of the Race Twin SC and Race Flywheel and install a Race exhaust or something. Brake balance doesn't really change stopping distance, if it actually has a change, it is too small to make any sort of difference. Also, you can have no wheelspin and have more than 0. Actually a slight amount of wheelspin is good. I believe that more breaking towards the front would cause the car to understeer during brake-ing or making it more stable. when its toward the rear, you can turn quicker (turn the steering wheel/ wheel) compared to the brakes being focused towards the front, but it can make the car feel "loose". Well that's what it seems like it did when I was doing a "lil' tune on a Porsche. Its mostly about personal preference I believe. Well my xbox live is going to run out soon and I don't plan on renewing it in the future. I figured now would be a good time to give back to the community, so here it is!